You’ve often heard of how your gum disease could lead to heart diseases, diabetes and even colon cancer, but it could also be the other way around – it could be your sinusitis that is causing your halitosis and gum disease. Around 9 million people suffer from sinusitis in the country. This condition is characterized by the inflammation of the layer of cells which line your sinuses. Caused by either virus or bacteria, signs and symptoms of sinusitis include having a runny or blocked nose, tenderness on your face especially on the space below your eyes and pain. Often times, sinusitis is felt alongside a very painful headache. It is also common for sufferers to run a temperature. The link between sinusitis and oral problems. While we know that sinusitis is a nasal condition, this disease can actually affect your oral cavity as well. For one, sinusitis is able to induce halitosis, a condition wherein your breath smells, toothache, and gum disease. These allegations have been confirmed in a study which was conducted by Longhini and Ferguson which was done within the country. The researchers were able to find that 100 percent of their respondents who were suffering from sinusitis also had dental-related conditions. Specifically, the study was able to find that 29 percent of the respondents, or 1 in 4 of every participant, had dental pain while 48 percent of the respondents have a foul breath and have noticed a bad taste in their mouths. The two latter signs are the well-known symptoms of poor oral health as well as sinusitis. Bad breath and gum disease. While bad breath is something which would hurt your self-esteem more than your physical health, the fact also remains that having a foul breath is another warning sign for a looming gum disease. 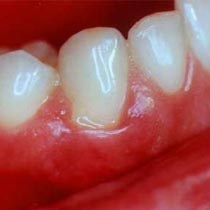 Gum disease is one of the leading causes of tooth loss. While gingivitis, the most prevalent form of gum disease, is characterized only by an easy tendency to bleed, periodontitis can actually damage not just the superficial tissues but also the deeper tissues up to the jawbones. Gingivitis is the mild inflammation of the gums which becomes evident with red and swollen looking gums, while periodontitis is severe inflammation of the gums including the deeper structures. Because the structures supporting your teeth and keeping them in place are compromised, periodontitis will eventually lead to tooth loss when not treated promptly.